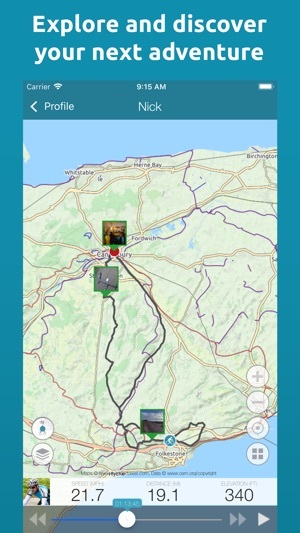 Cycling, running, walking, sailing or just when out on the move... you can track it all, and stream it live, with Map My Tracks. 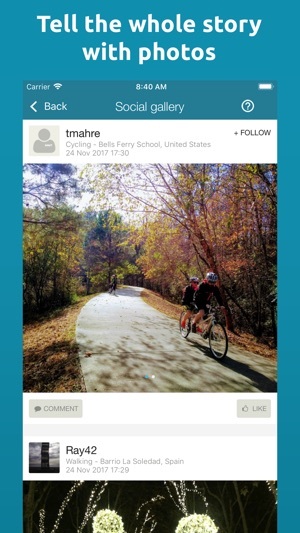 Join over a million other people who use Map My Tracks to track their cycling, running and walking workouts. 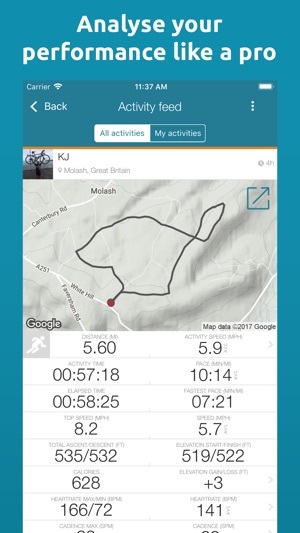 Map My Tracks OutFront turns your iPhone into a high performance all-sport GPS tracker that's amazingly easy, fun and motivating to use on bike rides, runs or walks as well as other outdoor pursuits. 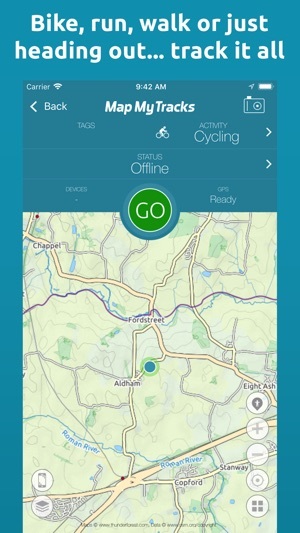 It's the only app you'll need to track all your outdoor activities including cycling, running or walking. • PLUS features are available with an in-app purchase. Subscriptions for Map My Tracks PLUS are $2.99 per month or $28.99 for a full year. Map My Tracks PLUS subscriptions will be charged to your iTunes account after your confirmation of purchase. Your monthly subscription will automatically renew each month and be charged through your iTunes account, yearly subscriptions will automatically renew each year. Subscriptions renew at $2.99 per month or $28.99 for a full year automatically unless cancelled at least 24 hours prior to the end of the current period. You can turn off auto-renew at any time from your iTunes account settings. Cancellation of the current active subscription period is not allowed. Map My Tracks OutFront is compatible with iPhone 8, iPhone 8 Plus, iPhone 7, iPhone 7 Plus, iPhone 6 Plus, iPhone 6, iPhone 5S, iPhone 5, iPhone 4S and iPhone 4. Use of ANT+ requires a Wahoo Fitness Ant+ key sensor or bike case. Visit www.mapmytracks.com/outfront for details. If you're enjoying Map My Tracks leave us a good review in the App Store. If not, send your feedback to support@mapmytracks.com and lets us fix it before you write a review. 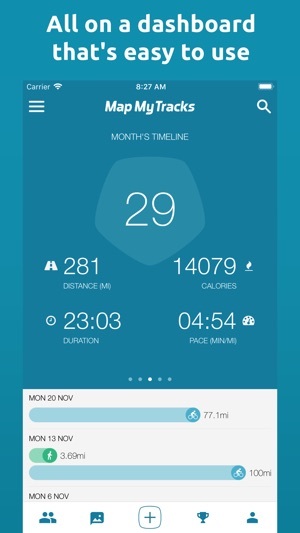 iOS 8 Health integration: Map My Tracks can now sync data with the iOS 8 Health app as well as other health and fitness apps that are participating. This service is optional. Small update to better load some maps after stopping an activity. I️ have been using this app for quite a while as an in-line skater. I️ was and still am relieved this app has inline/rollerblading as an exercise option. Except for a few places where the app seems to think I️ went way beyond my speed limit, the GPS works really well for me! I️ really enjoy watching the video through the map and seeing exactly where I️ was when I️ went up/down or how fast I️ had been going! The only two things I️ would have to complain about at this moment would be to having it work on Apple Watch, that way I️ can put my phone away completely and just stop/pause or start on the watch. Of course will continue to use the app despite these two things, thank you so far developers! I'm really happy with this app. Its simple to use and is great a good tool for keeping track of overall distance and altitude gained. Also I don't have to worry about getting lost since I can use it to backtrack if necessary. Works great on my iPhone 5. I have used this app reliably for many years and loved it for ease of use and reliability. Since December, however, the app is reliably unreliable. It incorrectly calculates distance and pace maybe because it randomly turns on and off while I am walking. It is set to use GPS in the background. I even deleted it and re-uploaded but that didn’t help. 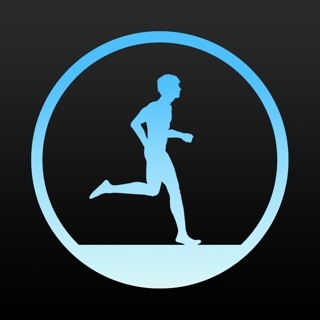 So sad to delete it from my phone permanently and find another walking app.